LAK-20T is an open class two-seater glider designed to meet the latest standards of the gliding industry. Glider is of normal aerodynamic configuration with "T" tail and wings slightly swept forward. 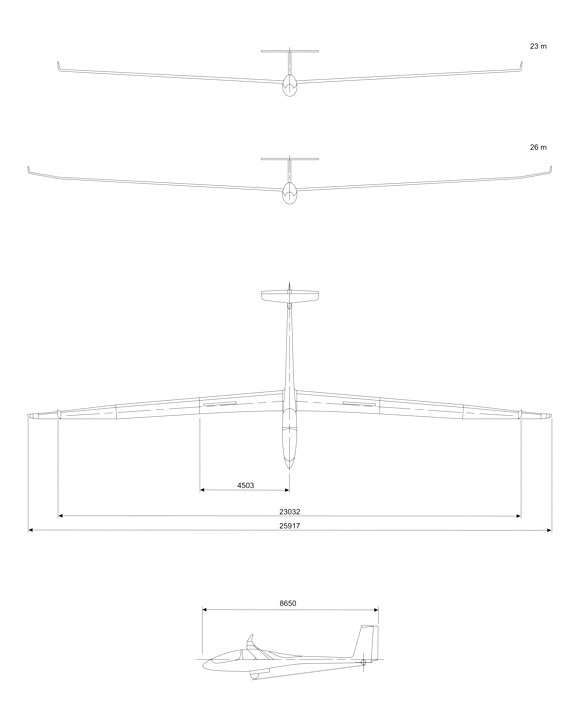 Due to changeable wingtips, glider can have 23m or 26m wingspan. Our latest achievements in engineering and aerodynamics allowed us to design wing with very high aspect ratio, which made possible to improve glider performance to the new levels. Glider is made of modern composite materials using already known LAK brand technologies such as use of pultruded carbon rods for the wing spar construction and others. Glider construction allows installation of the power plant. Self-launching (LAK-20M) version is planned with powerful SOLO 2625 02 engine.